About Product : How would you imagine your dream home to be? Music of birds, vast silence, the vibrant coloured hills, a blossoming garden, cozy pathways, echoing valleys, running water or splashing water, all this just out of your window. This collection is an experience of that sort. The motifs remind you of the forms and objects you wish to come across every day. Handwoven with Ikat technique and joyful colours, they are a sense of home woven into drapes and carryovers. 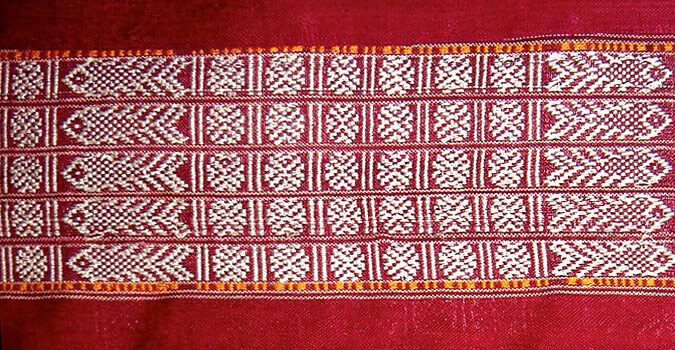 SAMBALPURI is a term used for the IKATs made in western Orissa. 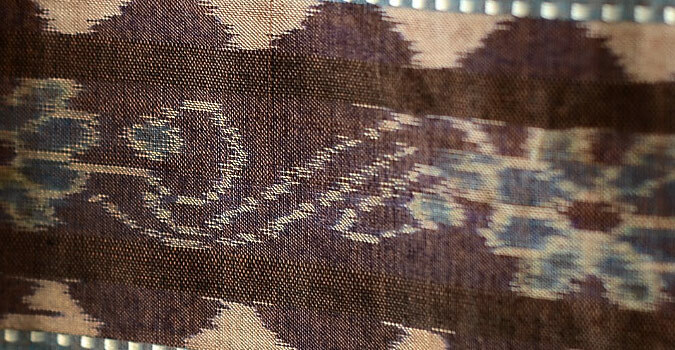 The whole of Western Orissa was undivided and called Sambalpur in earlier times and IKAT being a very well known textile of the region got its name from the region itself. The weavers however call it BANDHA meaning to tie. Tie and dye or IKAT is a process of tying required portions of the same thread and dyeing them in the dye bath so that the dye penetrates in the untied portions without affecting the tied portions and repeating the process several times by untying and tying again and putting it in different dye baths to bring out a number of colors in the desired areas. These threads when woven gives out a beautiful fabric with light colored feathery patterns which are both sided against a dark background. 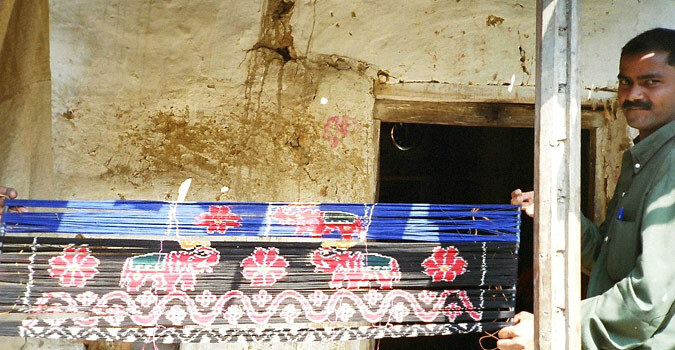 The technique demands a lot of precision and the level of craftsmanship of the tier as well as the weaver decides the clarity of the motifs seen on the fabric. 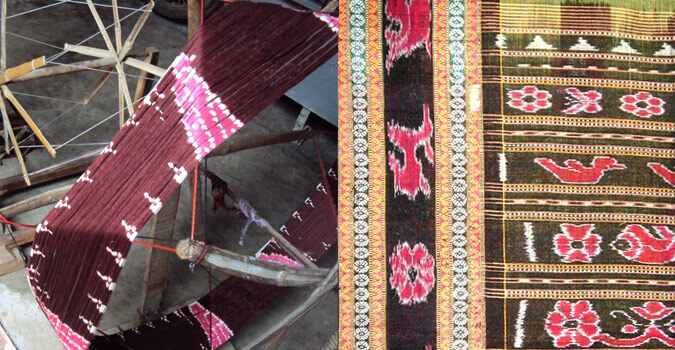 There are 3 types of ikat fabrics – warp, weft and double ikat. Warp ikats carry the pattern only on the warp yarns; weft ikat on the weft yarns and double ikats, matched patterns on both the warp and the weft. Many scholars feel that this type of textile design originated in Malaysia and Indonesia. They give two reasons in support of this, the first of course is the term IKAT itself which has Malayan origin. And second since this craft developed in coastal states like Gujarat, Orissa, and Andhra Pradesh etc. It may be presumed that the technology is an imported one which came through trade that existed through sea route. It is argued referring to the trade link between ancient Orissa and Bali in Indonesia which is still remembered every year while celebrating Bali Yatra in Cuttack says G.K Ghosh and Shukla Ghosh in their book IKAT TEXTILES OF INDIA. 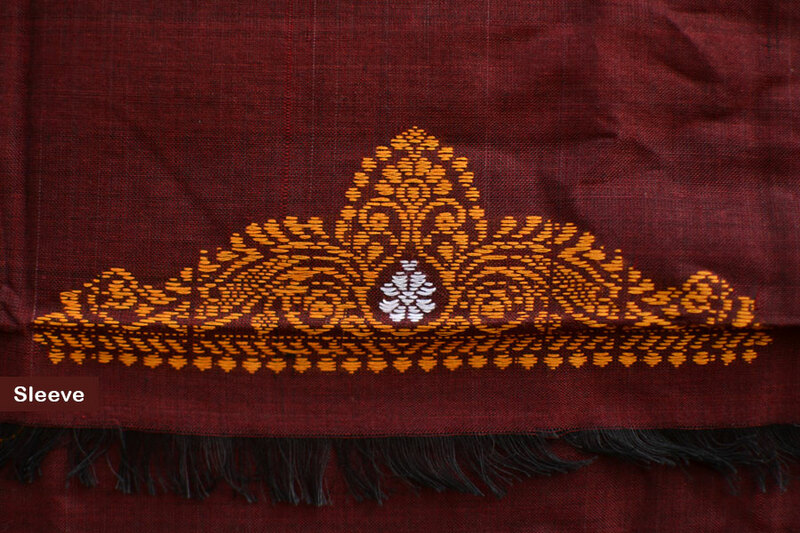 The SAMBALPURI fabrics are mostly made in cotton and the uniqueness of the fabric lies in the smooth curves of their motifs owing to the high skill of the Bhulia weavers of the region. The variety of motifs are very diverse ranging from animal motifs like elephant, deer, ducks and lion to floral motifs, the Konark wheel, and the kumbha or temple motif. 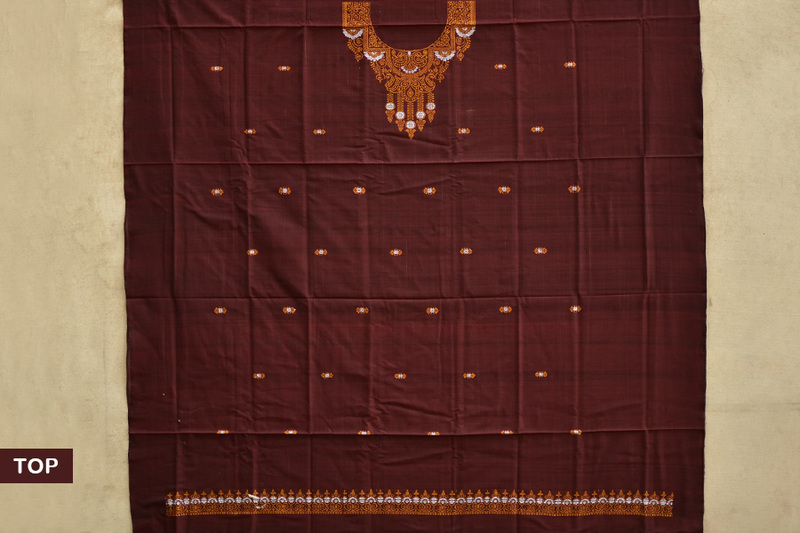 A traditional SAMBALPURI sari is do-muha meaning having two end pieces. The draping style of the region is such that both the end pieces are seen and also since the sari is both sided, it can be worn from both the ends which make it important to have two end pieces. Some elder women of the region are still seen wearing do-muha saris. The saris worn for special occasions have wide borders with many bands of extra warp figuring and very long end pieces.Those for everyday use have narrower borders and sometimes, but not always shorter end pieces. Traditionally, the value of a sari was assessed according to the amount of extra warp and weft patterning in the borders and two end pieces. 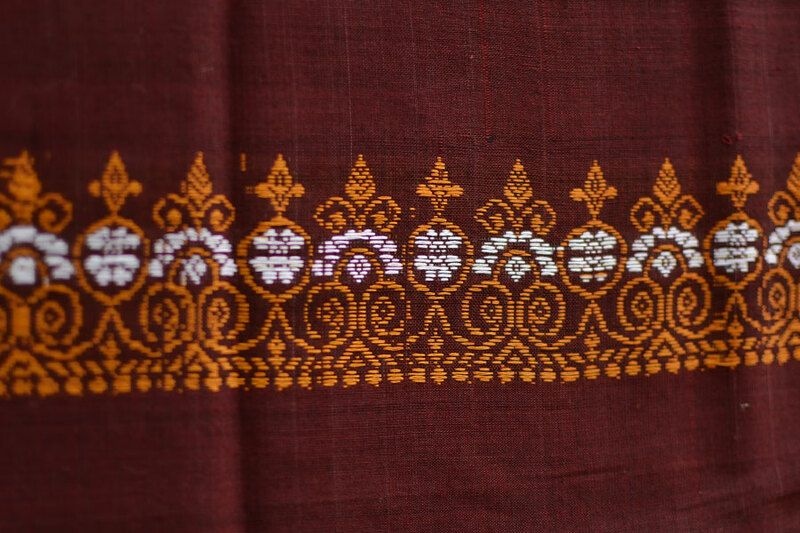 The most highly valued saris had ten bands in each border, which was known as das phulia sari (phulia in Oriya means flower as well as the border itself).These borders have fish (macchha), turtles (kechi) and rudraksha motifs woven as extra warp figurings. 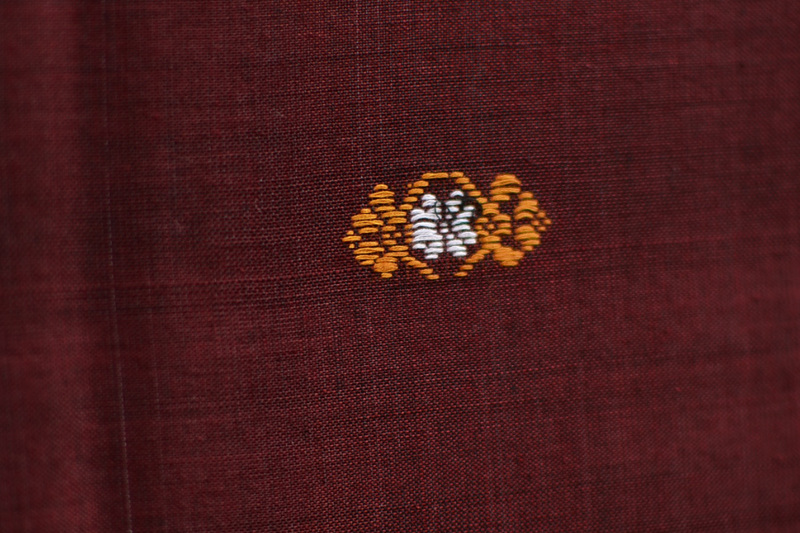 The older SAMBALPURI saris used to be very simple with plain body and IKAT border and muha. Extra weft or warp embellished the sari with the IKAT, unlike the saris seen today which are mostly all-over IKAT patterned. The colors were also limited to red, black and white. 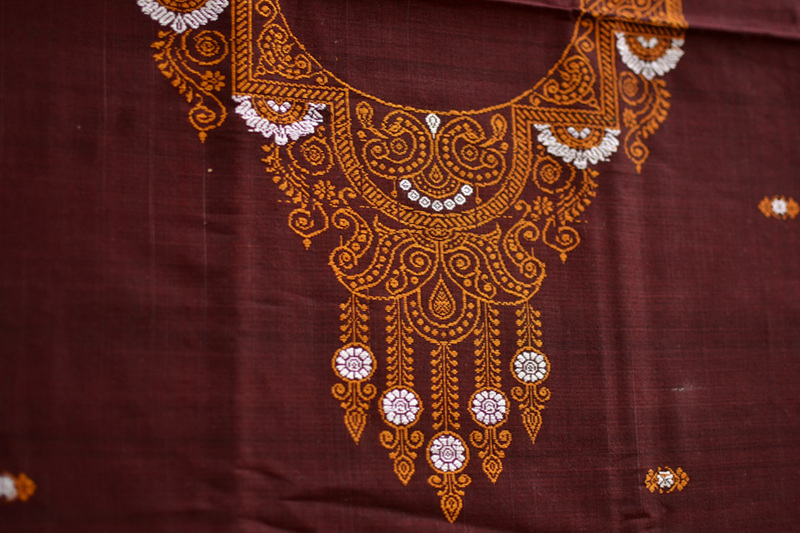 Earlier the motifs also used to be simpler because the motifs were translated directly from the weavers mind to the yarns without the aid of any graph. 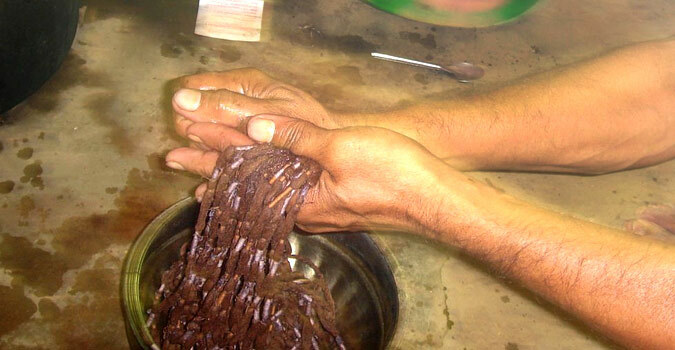 The technique has greatly improved and attained a very high level due to the patronage extended to it by the local people. The reason for such patronage is not far to seek as feudatory states were not easily accessible to mill-made textiles owing to poor communication. The people of these areas patronized colorful fabrics manufactured within their easy reach and in course of time developed a taste for tie and dye fabrics; the preference for such fabrics is still seen among the women folk of these areas. 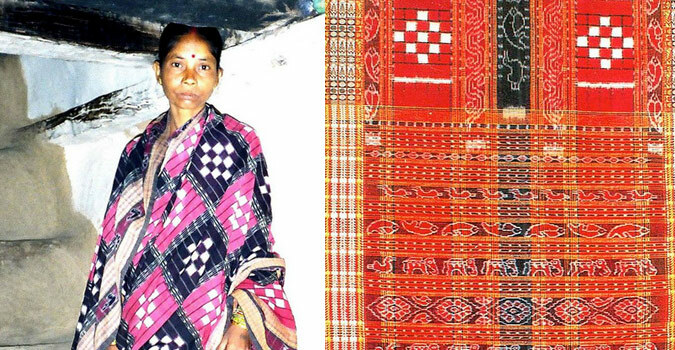 The SAMBALPURI saris have gone through many changes over the years. These changes can be divided in phases and in each phase, it has carried a very distinctive look. For example, the saris that were made in the early 20th century had a very traditional patterning with the colour palette limited to red, white and black. The motifs were also very simple. Then came the phase where Sambalpuri Bastralaya was established to revive the SAMBALPURI saris according to the then market demands. The result was a plethora of new designs flooded in the market. This was the phase when the color palette of the sari was extended and the end-pieces of these saris were treated as elaborate paintings. At times each motif had two to three shades of the same colour. Motifs like Konark chakra, elaborate floral motifs, temples, sometimes even scenes from famous movies were depicted in the end pieces. This was perhaps the time when many of the weavers got national and state awards. The next phase saw the introduction of all-over design or deh bandha. With the introduction of all over design, the multicolored saris got replaced by single colored sari with the motifs in an outline form to save the effort of dyeing the yarns more than once. This phase still continues with subtle changes where the plain field , border and end pieces are worked in IKAT. 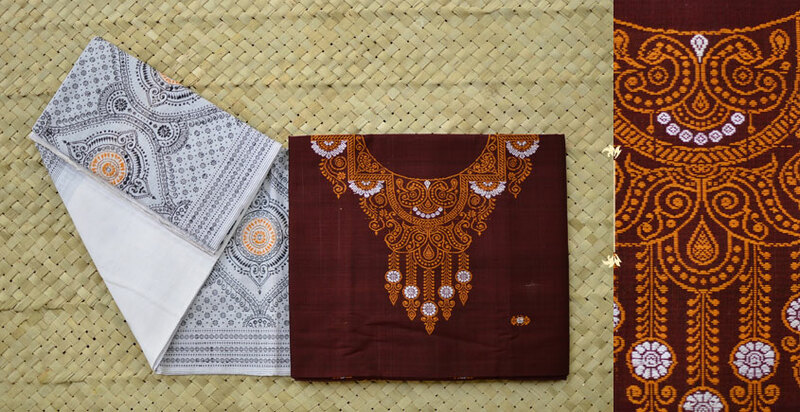 Apart from being known for its fine SAMBALPURI saris, western Orissa is also known for its rich cultural heritage. It has artists from all the fields, be it painters, dramatists, poets or sculptors. People are very religious and rooted to their old customs and beliefs. 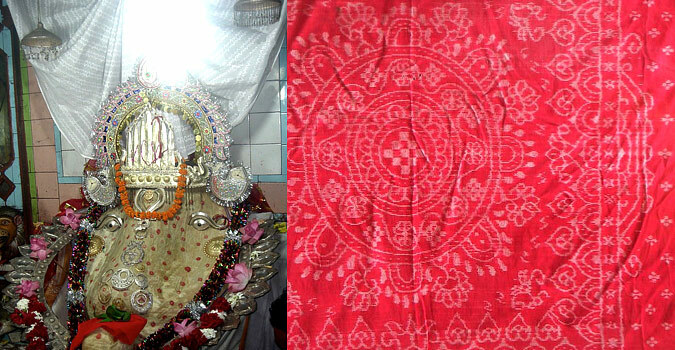 The SAMBALPURI sari is also a part of their traditions since a long time. It is mandatory for the bride to wear a Saktapar sari (SAMBALPURI) for her wedding because it is considered to be auspicious. It is perhaps, because of these religious connections that SAMBALPURI saris have stood the test of time in spite of being expensive. When spontaneous butterfly ideas marry the traditional tie-dye (IKAT) technique of western Orissa (sambalpuri), what emerges is an exuberant range of scarves by NEELI TITLEE. The label is a dream come true for Manisha Chawda, an alumnus of NID, Ahmedabad herself. Her tryst with sambalpuri textiles began during her final project at NID which required her to research the craft, conduct market survey and work with the weavers to come up with a range of stoles and dupattas for the contemporary market. After the completion of the project, she joined the industry like many of her peers had done. Soon enough, she realized that she never got over her love for the craft and eventually found her way back to the weavers , albeit in an entrepreneurial role. An in-depth understanding of the craft and willingness to work with the given constraints enables the label to stand out from the crowd. The design approach always revolves around the basic fundamentals of the craft and builds upon it to get an entirely new design, which is rooted in history, yet blends effortlessly into the contemporary emsemble. About Sizes Top 2.5 meter | Dupatta 2.25 meter.